full length photos of myself. Look at you! In less than a week you’ll be 50 years old. Who knew you would still feel this good? Oh, you’ve had your days but look at you now! Ready to take on the next 50 years with gusto and grace. You were a gift, given to me by the Creator of the Universe. Oh how I took you for granted when I thought you didn’t want to cooperate. I’m sorry for that now. I regret that so much time was spent trying to make you “perfect” so I could feel acceptable. Allowing the thoughts fed to me by an unhealthy culture to dictate what you would take in in order to be acceptable to others took a toll. When I gave up, I really gave up. There was no middle ground then, I am finding it now. The things I know now I wish you would have known at 20 or even 30. Not that it will help to lament those times because even that, accessing those paths of self discovery, is allowing us to be settled where we are. You and I have seen so much through those brown eyes. You’ve witnessed babies born and children die. Eyes often filled with tears brought on by both joy and sorrow. Forgive me for the times I tried to stop them in order to seem “strong” or “self controlled”. Those tears have often told a story that my lips couldn’t speak. Speaking of lips. That scar that was once so painful? It has a story. A tale of a misguided effort to make you fit in but instead, caused you to stand out. The beautiful chapter in our story of what it did inside of you. The soul that resides in you is tender to those who are different. That scar gave us purpose and meaning that a flawless face will never know. The smile, though it has seemed crooked at times, gives way to laughter even more these days. Oh, but those lips. How many times have words barged out that have caused everything in me to shudder (if not at that moment, sometime later). Over the years I prayed that those times are fewer as praise and adoration flow more freely. I still pray that wisdom has displaced foolishness and praise has crowded out complaint. Those hands held the hand of my mother as her body slowly released her soul into the arms of her loving Savior. Over the years they have played piano to bring pleasure. Like that one time in the nursing home when G’pa didn’t seem to notice but bragged three days later about how I had “played the pianey”. The crowd that day was most appreciative of my lifetime. If the years of practice was for that moment alone, it was worth it all. G’pa passed away a few days later, leaving me a gift I never anticipated. These same hands have kept children safe in parking lots, crowds and stores. They have brushed hair, bandaged boo boos and wiped tears. They have raised in praise, worship, thanksgiving and honor to the God who designed them. The fingers lace perfectly with those of my one true love. Arms that ached to hold more babies have been filled in unexpected ways. Who could have guessed they would have to wind their way through tubes and wires one day just to comfort my sweet babe as she clung to life? Those same arms seem to throw themselves freely around the necks of unsuspecting women who need the comfort. They fought off a carjacker, protected front seat passengers from flying forward and waved in excitement to locate someone in a crowd. I like more about you. The shoulders and back still have strength to carry a 75 pound child to her bed or wheelchair when needed. The neck holds my head high because I know whose I am. His love has burrowed so deep in my heart that knowing I am His has changed how I look at others. My thick brown hair has just a few strands of “tinsel” woven through. The rounded belly that welcomes laughter. 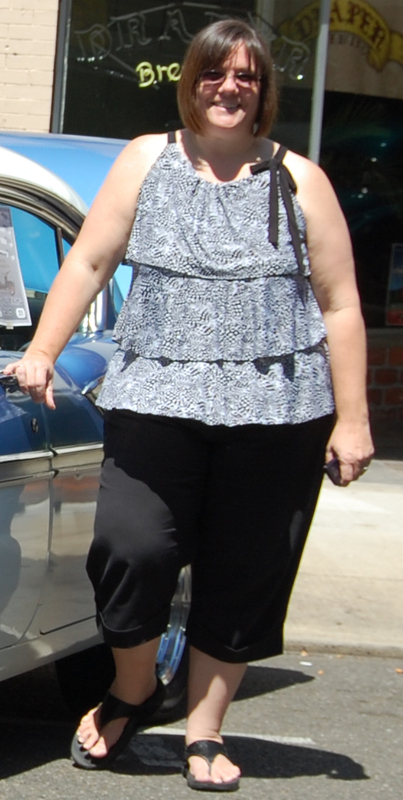 Sturdy legs that still work to walk, bike and stroll car shows or art festivals with my husband. I could talk about how I need a pedicure but instead I will mention how blessed I am to have feet. So dear body, although you are temporary, you are a gift. You are a part of my story, the legacy I will leave. When I am gone, it won’t be what I saw as flaws that will be remembered, it will be how I treated others. No one will stand at my memorial and comment on my dress size or how I was able to keep weight off after losing it. Hopefully, they will have something better to talk about. The time they saw compassion in my eyes, heard sweet encouragement from my lips or in silence my hand holding theirs when they needed a friend to see them through. Most of all, my prayer is that they will see the love of a Creator that uses ALL things for the good of those who love Him and are called according to His purpose. This is my contribution to SheLoves “A Love Letter To My Body” Synchroblog. Please stop by and read the beauty that women are finding right in their own mirrors.